Rackspace Hosting has launched an Australian startup pitching competition to find a small startup team making the biggest impact. Small startup teams (10 or less people) will pitch to a star-studded guest panel for the inaugural Small Teams Big Impact grand prize: a round-trip to San Francisco to visit the world famous Silicon Valley, meet with investors, and profile their product to the world. The winning entrepreneur will be interviewed in Robert Scoble’s studio, talking about their startup in front of his huge global audience: 335,000 Twitter followers, and 500,000 Facebook fans. “I get to travel around the world all the time to see some of the most exciting startups in the world. However, I’ve never had the pleasure of coming to Australia. I can’t wait to see what all the Aussie entrepreneurs have in store for the Small Teams Big Impact competition, both at the final event when I visit Sydney, and when they visit our shores for a recording session in our studio. I’ll be honest and say that it was giant US tech bloggers such as Scoble and TechCrunch’s Michael Arrington that were part of the inspiration for creating Delimiter, alongside locals such as Mumbrella’s Tim Burrowes. Without the pioneering work done by these giants, Delimiter itself and hundreds of other technology blogs probably wouldn’t exist. 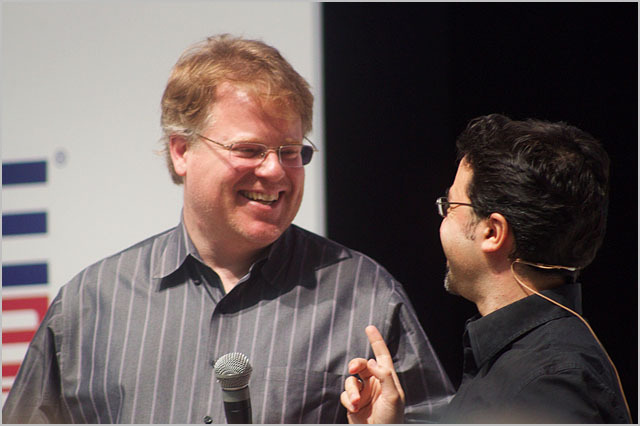 Scoble showed us all how social media was done, before the term social media really existed, and it has been tremendously exciting watching his career. It’ll be interesting to see what comes out of his trip Down Under. Now if only I could get 343,000 Twitter followers for Delimiter as well … I’d be set. I didn’t realise he had such a career, actually.